A person may need to use a commode when they have limited movement, are unsteady, or are in recovery. Allegro Medical offers bathroom commodes that are adjustable and flexible. These commode chairs can act as a raised toilet seat, shower chair, and a self-contained commode with a few quick changes. All are made from durable material, but different commodes are constructed with different placement and storage needs in mind. 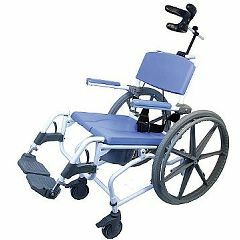 Some are made with wheels, making it easy to move from acting as a bedside commode to a different room, while others are made to fold up and put away.